"A cool refreshing cocktail that will remove the furrows from your brow. Use only the best quality gin. Note: Skewering the olive with a toothpick makes it easier to pick out when you're ready to eat it." Fill a cocktail shaker with ice. Pour in the vermouth, followed closely by the gin. Shake while counting to 30. Divide into 2 cocktail glasses. Garnish with 1 olive each. 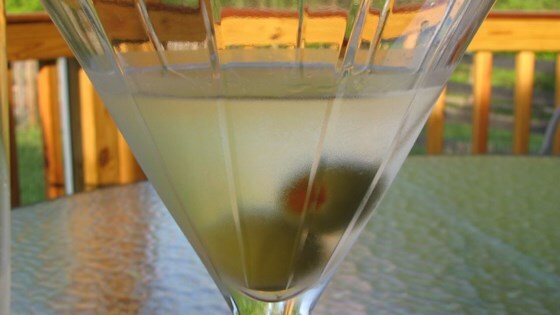 See how to make a classic vodka martini. This martini does have a nice ratio. But really, no good martini with olives only has one olive. I always use 3 and have fun with the stuffing (depends on what the finger food is). As near perfect as you can get.Garnish with two olives stuffed with Jalapeno.OOOOOOOO SOOOOOOOO GOOOOOOOOD. A true classic. One hint i have is to keep your gin in the freezer. Fabulous! !